San Francisco’s network of streets has several existing conditions that result in non-standard, skewed intersections: offset street grids that intersect one another, streets that cut through the prevailing grid at an angle, and intersections where more than two streets come together. One of the main safety factors at skewed intersections is lateral visibility. 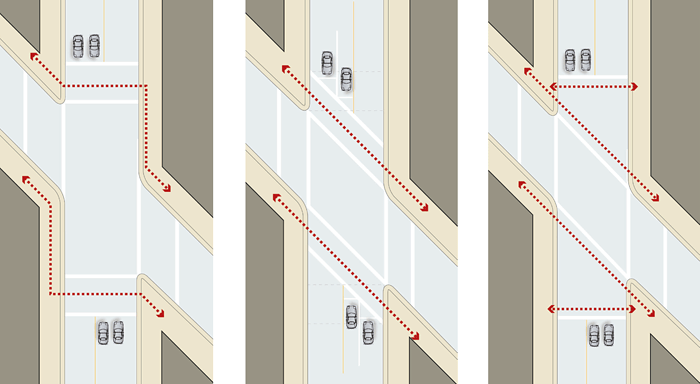 Drivers making acute turns have difficulty looking back at oncoming traffic to select an adequate gap. Because head and neck mobility commonly declines as people age, acute corners pose particular challenges and potential hazards for older drivers. Design features to mitigate the effects of skew include adding traffic controls such as all-way stop signs or traffic signals and/or geometric improvements to improve corner sight distance. Geometric countermeasures are generally the most effective approach to improving safety at skewed-angle intersections, but they may entail significant construction costs. Crosswalks at non-right angle intersections should normally follow the skewed alignment of the streets. Crossings that continue the alignment of the skewed streets are easier to navigate and provide the shortest, most direct pedestrian path of travel; however, the crosswalk itself is longer than a right-angle crossing would be. Crosswalks that are perpendicular to the cross street are shorter; however, imposing right-angle crosswalks on a skewed intersection forces pedestrians to detour around the intersection, and is less intuitive for wayfinding, creating challenges for those with impaired vision. To give pedestrians more options, designers may also consider flaring the crosswalk into a funnel shape so that the inside edge aligns with the sidewalk on both sides of cross street, and the outside edge is at a right angle with the cross street. Care should be taken not to push the crosswalk so far back that sight lines needed by turning motorists are compromised and the intersection clearance increases, resulting in more vehicles passing through the crosswalk during the pedestrian walk phase. The skew has the advantage of keeping the pedestrians closer to the intersection for turn visibility and keeping the clearance distances to the minimum. The preferred design for stop bars at skewed intersections is to orient them perpendicular to the vehicle lanes and stagger them in a stair step pattern back from the angled crosswalk. Crosswalk configurations at skewed intersections. Where streets intersect at non-right angles, the two corners with acute angles will have sharper turns than a standard intersection of the same width. In order for larger design vehicles to make the turn, oversize curb radii may be required, which, especially when combined with the crossing distance added by the skew, can result in very wide crossings. Due to turning radius requirements at the acute corners, skewed intersections will often necessitate a slip lane for right turning vehicles, with a corner island to break up the pedestrian crossing. Raised corner islands provide a pedestrian refuge and are preferable to simple painted islands. Wherever feasible, slip lanes should be removed to connect the island to the sidewalk with a corner plaza and shorten the overall crossing distance. Unusual intersections often offer the opportunity to use excess right-of-way space to create small corner plazas or landscaped areas, especially by removing a slip lane. Where this is not possible, other design strategies should be considered, such as special paving treatments in the slip lane, raised crosswalks, or auto restrictions (transit and bicycle-only lanes). Conversion of a corner slip lane into a public space. A coherent pattern of intersection lighting at complex intersections can reinforce the legibility of the intersections as a single, unified place and enhance pedestrian orientation. Consistent lighting at each corner should be used to achieve this effect—when a street’s overall lighting is being upgraded, lighting designers should identify any non-right angle intersections and pay special attention to these. Roundabouts have limited applicability in San Francisco, and can create difficult pedestrian and wayfinding conditions. However, they may be an appropriate and desirable treatment at complex, multi-leg intersections to simplify the traffic movements and create central public or green space.